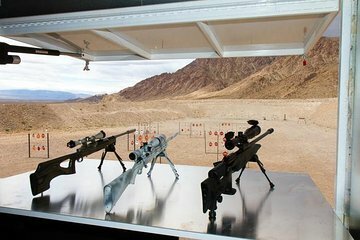 Experience the excitement of unloading clips during this outdoor shooting experience in Las Vegas. Choose from more than 50 different guns, including full-automatics, snipers, and more. Learn about operations and safety from your expert guide and instructor and then take to the course with a private and small-group option. Take home photos from the shooting line free of charge and enjoy the luxury of limousine transport included in the tour. From start to finish it was a great experience. We were picked up in front of our hotel a little earlier than scheduled so we weren't waiting long outside. Our driver (I think her name was Chanel) was very professional and pleasant. I enjoyed the scenic ride of 45 minutes to the range. All the instructors were patient and knowledgeable. I learned a lot and had a blast firing 15 different weapons, especially the sniper weapons. I highly recommend Shoot Las Vegas, you won't be disappointed. 'Wow' what great experience, with a fantastic bunch of guys who looked after us from start to finish. The free videos and pics was a real bonus, highly recommend and would definitely book again on our next trip. This is definitely the best thing to do while in Vegas. They got a huge variety of guns and especially the amazing .50cal Barret or the Machine Gun. They will pick you up from the hotel and bring you to the range which is really good, basically a mountain dead end, lots of space. Everyone was super friendly and patient, especially Brighton, she will brighten your day!!! Worth a mention is that you will probably be doing some off-roading in a limo, which was kinda unique! The tour was amazing! Very professional people who made you feel unstoppable and safe. Cool location in the middle of nowhere. Awesome time. Great staff. The most fun you can have with your cloths on. Will do it all again. This was an awesome trip super friendly and helpful guys and girls, even more so as we had never fired a gun. My wife was a little worried but the lady ( can't remember her name sorry) was so patient that by the end my wife was shooting better then me lol. We were picked up at our Las Vegas Hotel by Brighton, very chatty and a good safe driver. The outdoor Shoot Vegas site was amazing, with mountains all around. Austin and Brian gave us instruction how to handle guns safely. We were able to choose our guns from a large selection with details of the kick with them. Brian's comments were hilarious, but always made sure you were safe when shooting. I took an upgrade with Brighton, shooting longer distances, what an amazing experience. Thanks Austin, Brian and Brighton for an awesome experience. Would recommend Shoot Vegas, the best outdoor gun experience.